When we set off for Oregon, we weren't planning a beer-themed vacation. It just sort of turned into that. 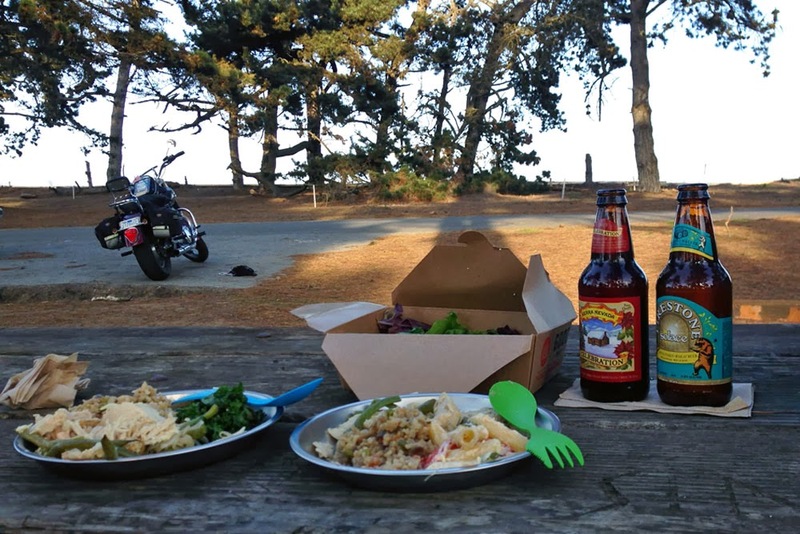 Beer is a good drink for camping, Oregon is full of craft breweries, many of those breweries serve relatively affordable food. Hence a beer vacation. But if you rewound back in time, the idea of us enjoying a beer-themed vacation would have seemed farfetched. Let me explain. When we moved to San Francisco, I didn't drink beer at all. "I don't like the aftertaste," I always said, "It's too bitter." Argentina is the full of excellent affordable wine, but its beer selection is hardly noteworthy. Many restaurants only carry a watery lager called Quilmes. I arrived in San Francisco with no appreciation whatsoever for good beer. What changed between then and now? We started taking a lot of motorcycle camping trips and we toured the Sierra Nevada brewery. There's something about beer that makes it the perfect drink for camping. Maybe because it's easy to carry, or because it comes in reasonably sized bottles, or because it's refreshing and not as dehydrating as wine or hard alcohol. I have particularly fond memories of drinking pumpkin beer on our first-ever California camping trip. At the time, pumpkin beer was the only beer I liked, preferably Shipyard Pumpkinhead Ale. We take multiple camping trips a year, and since that trip we have almost always brought beer with us (see Thanksgiving 2013). And on the last day of that fateful trip, we took a second step toward my embrace of beer. We toured the Sierra Nevada brewery. Before this tour, I couldn't articulate anything about beer. I had no idea what hops were or what a malty beer tasted like. All I knew was that when someone gave me beer, I usually didn't like it. The tour guide explained the process of making beer. We smelled hops and watched the beer getting spun around in a centrifuge. The tour concluded with a tasting of several different beers. The guide explained the concept of IBUs and suddenly it clicked: I didn't like hops, but I liked beer, especially light wheat beers. The irony is that now that I like beer, I don't particularly like Sierra Nevada beer. So that's where I started, with wheat bears. Not long after, a Whole Foods employee suggested Blue Star Wheat Beer, by North Coast Brewing Company in Fort Bragg. And that beer graced our fridge for months. Every so often, Ben would branch out and buy something new for himself, but I stuck with my trusty standby. I watched most of the 2013 Stanley Cup playoffs over FaceTime with my family and when they'd crack out their beer, I'd grab a Blue Star from the fridge. I branched out slowly from there — Blue Star at home, Shock Top at the pizza place in Tahoe, Blue Moon when in Winchester. 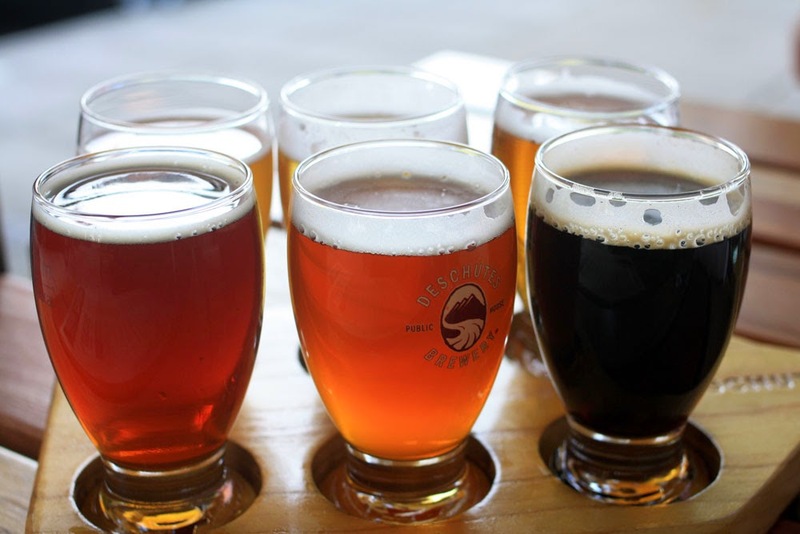 All of which is to say that by the time we left on our Oregon vacation, I'd gotten over my dislike of beer and was more than ready to embrace the many wonders of Oregon — its waterfalls, food trucks, lakes and, yes, its beer. The best part of this is that since we've returned I've moved beyond my reliance on wheat beers. I haven't embraced hops yet, but I did voluntarily buy a Deschutes White IPA and almost enjoyed my cousin's Lagunitas IPA. We've also started buying sour beers. Blue Star hasn't dominated our fridge in months, though Shipyard Pumpkinhead makes an appearance every fall. I wish at this point that I could remember more about our beer journey through Oregon. We always planned to write a blog post about beer, but while we took notes about the rest of our trip, we didn't do a very good job documenting our beer discoveries. I've pieced what I can together from our notes, photos and my memory. In general, we loved breweries that offered both beer samplers and food. The beer samplers provided an easy way to branch out and to compromise between our differing interests. I didn't have to stick with tried-and-true wheat beers when ordering in smaller quantities. Ben could throw in an IPA or two that I could try and he could finish if I didn't like it. And the breweries offered much more interesting options on-site than what they sell in big retail stores. All in all, we tried at least 50 different beers on this trip (I swear I'm not exaggerating). Deschutes served by far our favorite beers, though Full Sail in Hood River won for the best tasting room (a covered deck overlooking the Columbia River). Here's our list of beers we remember trying, as well as a description of each beer. I've noted beers that we particularly liked. Red Seal Amber Ale: Malt and hops are beautifully married in this full-bodied, copper-red Pale Ale. 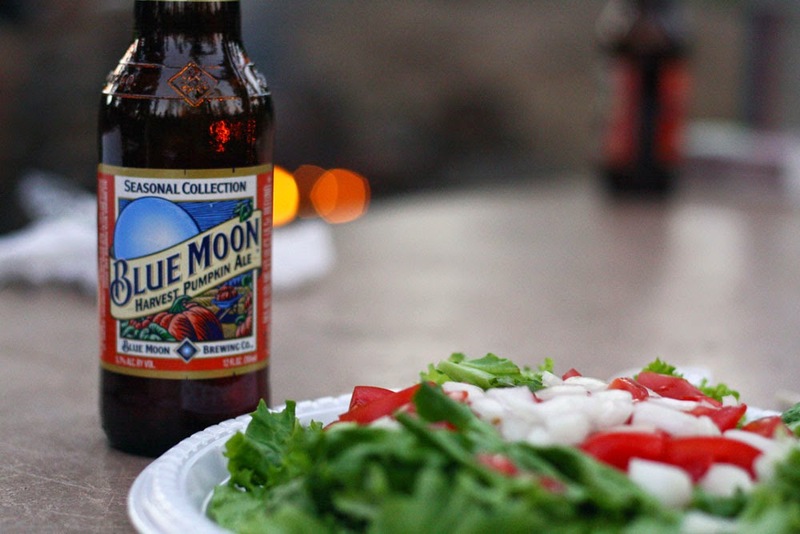 Red Seal Ale is generously hopped in the traditional manner for a long, spicy finish. Old Rasputin Russian Imperial Stout (not one of our favorites): Produced in the tradition of 18th Century English brewers who supplied the court of Russia’s Catherine the Great, Old Rasputin is a rich, intense brew with big complex flavors and a warming finish. Brother Thelonius: This Belgian-style abbey ale is rich and robust with an ABV of 9.3%. PranQster Belgian: PranQster follows in Belgian ale tradition using a mixed culture of antique yeast strains that results in a floral nose, a full fruity flavor and a clean finish. Fresh Squeezed IPA (one of Ben's favorites): This mouthwateringly delicious IPA gets its flavor from a heavy helping of citra and mosaic hops. Chainbreaker White IPA (one of our favorites): Brewed with wheat and pilsner malt; this IPA displays beautiful citrus aromas from Cascade and Citra hops that meld with the esters of Belgian yeast. Think thirst quenching hopped-up wit beer with enough IBUs to warrant the IPA name. Not the Stoic (one of our favorites): Aged and sequestered in select oak casks. The result — a contemplatively brewed quad created in homage to all those who doubted the original. Doppel Dinkel Boch (my absolute favorite): Double down with this imperial spelt beer that features a generous amount of dinkel (spelt) malt in place of the traditional wheat malt. The result features aromas of bubblegum, banana, clove, citrus, and a slight spiciness. New Bruin Fruited Sour Brown (one of our favorites): This fresh, soured brown ale was fermented with lactobacillus and a Belgian yeast strain and conditioned with Szcechuan peppercorns and Italian plum. The result is a snappy tart brown, with palate tingling spice ready to enhance any food pairing. Cream Ale: This American style Cream Ale is one of the smoothest beers ever made at Deschutes Brewery. The grist bill consists of Pale Malt, Honey Malt, Flaked Barley, Munich, and Rolled Oats. The cirtal hop flavor is imparted by Hallertau and Crystal Hops. Twilight Summer Ale: This clever golden-hued ale pours remarkably crisp and clean. A distinctive malt body complements a refreshing hop profile led by a heady dose of bold Amarillo hops. Session Premium Lager: An extremely tasty import-style lager, like the kind of beer made back in the pre-Prohibition days— plenty of flavor that goes down clean and smooth. American and European hops offer a wonderful noble hop aroma, and the two-row barley malt and a touch of wheat malt give a pleasant, refreshing finish. ABV 5.1% IBU 18. The Vaporizer: The Vaporizer is a golden-hued Pale Ale that features a beautifully hoppy aroma and flavor. The malt is 100% Gambrinus Pilsner, a sweet and supple malt from Gambrinus Malting in British Columbia. The hops are primarily of the Challenger variety, grown on a single farm in the Yakima Valley. Dry-hopped to pump up the hoppy goodness. 6.0% ABV, 55 BU. Kolsch: In Cologne, many a brewery produces a light-bodied ale with a delicate fruitiness and rounded maltiness, attributable to the unique yeast strain commonly used. This Kölsch is unfiltered and more generously hopped than its German cousin. 5.2% ABV, 40 BU. Sacre Bleu: This beer uses yeast from Abbaye de Scourmount (they make a little beer called Chimay) in Belgium. The roasted fig, clove, and ripe banana esters shine through the dark fruit, malt forward body. Belgian candy sugar lends a light caramel flavor, and dries the beer out very nicely. Brewer’s Gold hops balance the entire beer, leaving it clean on the palate. 7.4% ABV, 35 BU. Lulu (one of our favorites): This beer blushes with additions of hibiscus, pink peppercorn, and pink rosebuds. An earthen tartness mingles with floral and tangerine aromas, and a slight warming at the back of the mouth rounds out this saison. 6.5% ABV, 39 BU. Cluster: The oft forgotten "Cluster" was the dominant hop in the U.S. brewing industry for centuries. A more delicate floral note at the top leads you deeper in to a grove of pineapple and orange, and a dewy herbal character follows closely behind. This year’s version glows like an early summer sunset, has a clean bitterness, and it dried out nicely, making it highly drinkable. We stopped in here for a drink and I have no idea what we had. I know we didn't like it as much as the beers at other brewpubs. Kellerweis: Inspired by traditional Bavarian techniques, Kellerweis is a true artisan experience. Brewed in open fermentation tanks — a process rarely seen today—to let the ingredients truly shine. The result is a hazy wheat ale — untamed, raw and alive. With a full, fruity aroma and notes of spicy clove and banana bread, Kellerweis is a truly unique brew. Summerfest: Since their invention in the 1840s, Pilsener-style beers have become the world’s most popular style. With a nod toward the original Czech tradition, Summerfest is brewed to feature the best of Bohemian nature. Crisp, golden, dry and incredibly drinkable, Summerfest has a delicate and complex malt flavor and spicy and floral hop character — the perfect warm weather beer. Bigfoot Barleywine: Bigfoot is a beast of a beer, brimming with bold flavors of bittersweet malt and heaps of aggressive whole-cone Pacific Northwest hops. First introduced in the winter of 1983, Bigfoot is a cult-classic beer brewed in the barleywine style, meaning a strong, robust, bruiser of a beer with the refined intensity of a wine. Old Chico Crystal Wheat: This filtered beer is brewed with malted wheat and barley, and perfectly balanced by unique Crystal hops. Old Chico is a great choice for those new to craft brew and longtime beer aficionados alike — light-bodied, refreshing and wonderfully drinkable. 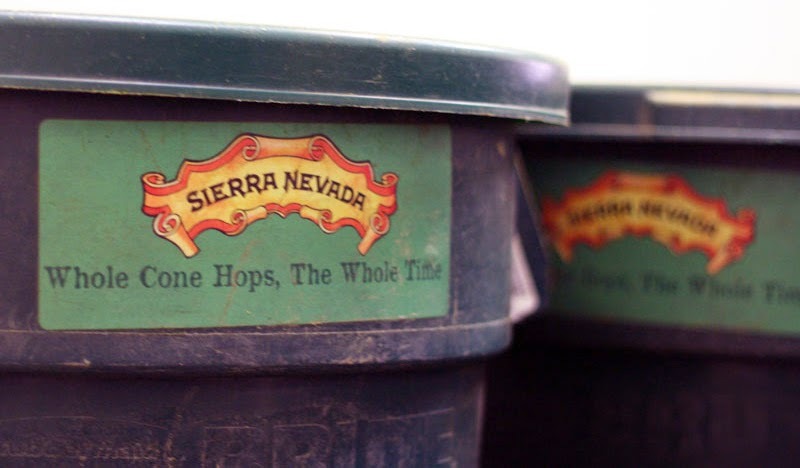 Sierra Nevada Southern Hemisphere Harvest: Southern Hemisphere features fresh New Zealand hops that are picked, dried and shipped to the brewery within seven days. The result is a complex beer that showcases the floral and herbal flavors and aromas of Southern Cross, Pacifica and Motueka hops. Rogue Mom Hefeweizen (@ Bridgewater in Florence, OR): Mom Hefeweizen is a refreshing, American-style wheat infused with Oregon Roses. Breakside Brewery India Golden Ale (@ Interurban in Portland, OR; one of Ben's favorites): Originally crafted with Ninkasi Brewing, this double IPA is the lightest, hoppiest beer you’ll ever try. Loaded with tropical and fruity notes from Mosaic, Eldorado and Chinook. Widmer Brothers Hefeweizen: This naturally cloudy flagship brew starts with the highest quality wheat. Its bold, clean flavor and pronounced citrus and floral aromas are what define American-style Hefeweizen. Pyramid Hefeweizen: This American-style Hefeweizen is a unique take on the traditional Bavarian classic. This refreshingly unfiltered wheat ale delivers a distinctively smooth flavor worth savoring with friends. Full Sail Amber Ale: This is a sweet, malty, medium-bodied ale with a spicy, floral hop finish. It’s brewed with 2-row Pale, Crystal and Chocolate malts and hopped with Mt. Hoods and Cascades.